I love to be comfy but now as a Preschool Teacher, I have to dress up, look professional but also be functional and comfortable in order to get down to their height, play with the children and help them. 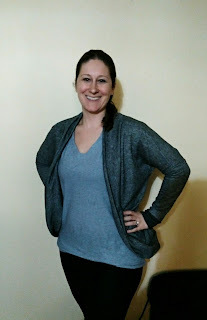 So when I can find a company that provides comfy clothes that are stylish, durable and versatile, I feel like I hit the clothes Jackpot! I usually wear my exercise clothing from the minute I get up on my days off because I work out different times throughout the day. I might sneak in a kickboxing workout and then head out for a walk with my children. 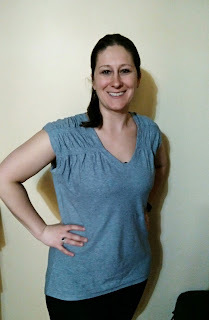 But it doesn't hurt to look stylish and modern while I exercise and run errands so even on my days off I choose my prAna clothing! I love that I can wear prAna clothes to workout and then to head to the grocery store and even pair with a sweater and skinny jeans for a night out or when I am teaching! I hate changing my clothes 50 times a day (who's got time for that??!!) so prAna clothing is a must in my wardrobe! I recently received the Constellation Tee in Fairhope Blue and it is so great for workouts or pairing with a sweater and skinny jeans or leggings! I have worn it working out or teaching - and it always feels great, fits great and looks great! The Constellation Tee features an organic cotton/hemp blend knit and includes a V-neck, cap sleeves and shirrtail. I love wearing this Tee running because it doesn't ride up with the nice V-neck or show too much skin. It also covers my bottom with the shirttail element and I love that for when I wear yoga pants! Not only is prAna versatile and stylish, they also use sustainable and organic materials and I love to support that! You can purchase the Constellation Tee for $69 from the prAna website. Make sure to use discount code AEMAS18. This gives you 15% off any non-sale prAna items ordered on the website. It will be valid through May 1st.